Steganos has kindly offered our DCT readers a chance to win its new Privacy Suite 19 release. We have five licenses for five lucky readers. Each license is currently valued at $59.95 (US) and is good for 5 PCs. “Do you leave your front door unlocked? Do you have the same key for your house, your car, and your office? Would you trust a complete stranger with your keys? Of course not! Passwords are the keys to your digital life, and the variety and quality of your personal passwords is crucial for online security. “Confidential documents, business records and TAN lists all belong in a safe place. 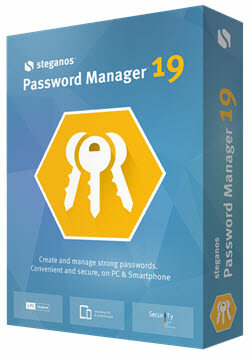 Steganos Safe 19 is a digital vault that protects everything you don’t want anyone else to see. Data protection made in Germany – with the click of a button, Steganos Safe 19 protects all types of sensitive data on your PC, in networks, or in the cloud thanks to state-of-the-art 384-bit AES-XES encryption with NI-Hardware acceleration. We’d appreciate it if you’d take a moment and submit a comment telling us why you’d like to win Steganos Privacy Suite 19. However, submitting a comment is not required to enter this contest and will have no bearing on your chances. For your chance to win, simply enter your name and valid eMail address in the spaces provided below, then click Enter Contest. After your entry is accepted you will be presented with options to share the contest on Twitter and/or Facebook. For each person that enters the contest as a result of your share you will earn two (2) extra entries!